In the middle of a few beers, I managed to record and put together the final podcast for 2006. Unfortunately, no guests, just straight into the latest Haiku news, so you (and I) can start ringing in the New Year. Merry Christmas to all and have a Happy Haiku New Year ! Yes sire, 2006 has been an interesting year for Haiku. It has certainly overcome quite a few milestones, one only needs look at the WalterCon videos to see that. With that in mind, 2007 is going to be bigger and better, so stay tuned for more Node monitor goodness. Peace. "Thanks to the dedicated work of lead developer - Axel Dörfler, the Haiku network stack has started taking it's first baby steps." And with those first steps, I managed to try out the latest Haiku image under VMware's Free Player. You can download the VMware image from here. For information on how to configure your network, click here. If you're on Windows and looking for an easy way to get and try out the latest Haiku, try my vmHaiku app. Now that the dust has settled from WalterCon 2006, we at the Preferences Team, are looking forward to the coming year. We have a new team page, which will hopefully be launched with the new site within a week or so (fingers crossed eh Koki). The new team page is designed to give focus to new and existing developers. I'll also be creating some tools of my own, as I'm using DotProject to manage all the Applications. DotProject has no public front end, and over the coming months, I hope to develop something to show off the status of the various applications. Also, I was bored the other day, so I made up some Haiku OS chicklets. "WalterCon 2006 was held this past weekend in Orlando, Florida, and for those who have been waiting to know what it was all about, the wait is over. Jem Matzan of The Jem Report was at WalterCon, and he has written an interesting article on the conference that gives an overview of the event, and also makes some insightful observations as someone new to the project and the platform." With just 39 days to go til WalterCon 2006, I thought you might want to head over to the Official WalterCon site and check out the details for this year, along with photos and write ups of previous events. For more coverage of WalterCon, HaikuPodcast are rumoured to do a few interviews / segments as well. 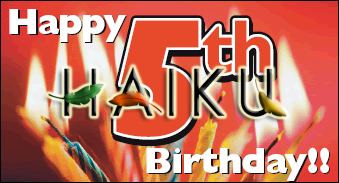 The Haiku OS project turns 5 today. Back in August 2001, Michael Phipps "founded" the open source replacement for BeOS, called OpenBeOS, on the mailing list. In 2004, the name was changed, in order to avoid infringing on Palm's trademarks (now owners of BeOS). The new name was influenced by an official community vote and was then revealed at WalterCon, the US-based Haiku annual conference. Five years on and Haiku now boots on real hardware to an accelerated desktop. It can run many R5 applications, has a network stack in post-alpha (soon to be beta), and can performed tasks via USB that R5 could only dream of. It's stability increases week by week and should be capable of replacing R5 and going beyond in the not too distant future.